Dr. Eugenie Brunner reveals that more people may be choosing to have plastic surgery as public perception of cosmetic enhancement has improved over the last few decades. Princeton, NJ — In magazines, on social media platforms, and among friends, more people than ever seem to be openly discussing their experience with or desire to have plastic surgery. 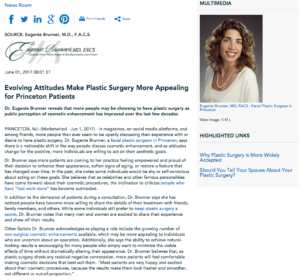 Dr. Eugenie Brunner, a facial plastic surgeon in Princeton, says there is a noticeable shift in the way people discuss cosmetic enhancement, and as attitudes change for the positive, more individuals are willing to act on their aesthetic goals. Dr. Brunner says more patients are coming to her practice feeling empowered and proud of their decision to enhance their appearance, soften signs of aging, or restore a feature that has changed over time. In the past, she notes some individuals would be shy or self-conscious about acting on these goals. She believes that as celebrities and other famous personalities have come forward about their cosmetic procedures, the inclination to criticize people who have “had work done” has become outmoded. In addition to the demeanor of patients during a consultation, Dr. Brunner says she has noticed people have become more willing to share the details of their treatment with friends, family members, and others. While some individuals still prefer to keep plastic surgery a secret, Dr. Brunner notes that many men and women are excited to share their experience and show off their results. Certified by the American Board of Facial Plastic and Reconstructive Surgery as well as the American Board of Otolaryngology, Dr. Eugenie Brunner is the recipient of numerous honors and awards. She has been named a Castle Connolly “Top Doctor” eight times and received a Patients’ Choice Award twice. Dr. Brunner is a member of several esteemed medical organizations, including the American Academy of Cosmetic Surgery, the American College of Surgeons, and the American Society for Laser Medicine & Surgery. She earned her medical degree from the Robert Wood Johnson Medical School – University of Medicine and Dentistry of New Jersey and her undergraduate degree from Rutgers College. Dr. Brunner is available for interview upon request.